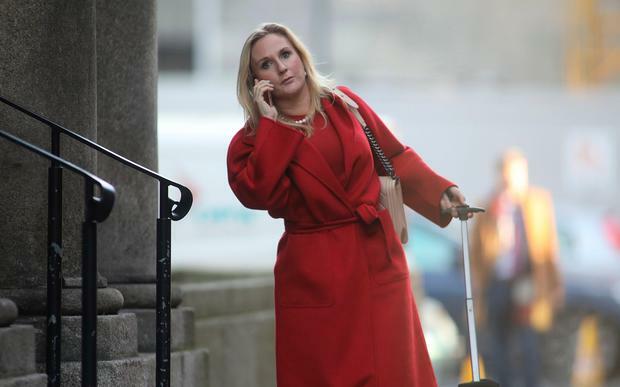 Gayle Dunne, wife of bankrupt developer Sean Dunne, has won an appeal over a refusal to allow her lawyers cross-examine an American attorney involved in her husband's US bankruptcy proceedings. A three-judge Court of Appeal on Tuesday ruled fair procedures required that Ms Dunne's counsel should have the opportunity to cross-examine Timothy Miltenberger, the lawyer acting for the "Chapter 7" trustee dealing with Mr Dunne's US bankruptcy. Mr Dunne has been separately adjudicated bankrupt in Ireland. The official handling that bankruptcy, official assignee Chris Lehane, brought proceedings over the alleged fraudulent transfer of assets in South Africa and Ireland between Mr and Mrs Dunne. The High Court, in February 2016, dismissed Ms Dunne's application to cross-examine Mr Miltenberger in relation to her challenge to those Irish proceedings. The court later also rejected her application for a strike out, or alternatively a stay, of the Lehane proceedings because she said they duplicated the American case and were an abuse of process. She also argued America was the appropriate jurisdiction or forum for the proceedings, known as the doctrine of "forum non conveniens". Mr Justice Gerard Hogan, on behalf of the appeal court, allowed Ms Dunne's appeal in relation to the question of cross-examining Mr Miltenberger. That would be part of an essential fact finding exercise which an Irish court must conduct prior to determining the appropriate forum question, he said. Even if this fact finding exercise was to lead an Irish court to the conclusion that the proceedings were solely a matter for the US Chapter 7 trustee, this would not necessarily dispose of the appropriate forum question, he said. This is because an Irish court would then have to proceed to determine whether this country would recognise judgments and orders in US bankruptcy proceedings which came from "a potentially exorbitant bankruptcy jurisdiction affecting both moveable and immoveable property in Ireland", he said. He stressed his judgment was not intended to offer any view on these questions other than to repeat what the Supreme Court had said was the importance of determining these foreign law issues as a question of fact as a preliminary to determining all the other questions. In allowing the appeal in relation to the cross examination of Mr Miltenberger, Mr Justice Hogan said a similar facility must be provided to official assignee Lehane to allow his lawyers cross examine Ms Dunne's US attorney, Alec Ostrow. It followed that the High Court's decision on the appropriate forum question must be vacated. He was therefore sending all these matters back to the High Court so that the appropriate forum issue can be determined in the light of his judgment. Official assignee Lehane's proceedings relate to agreements between Mr and Mrs Dunne in 2005 and 2008 to transfer interests to her a number of assets, including a hotel called "Lagoon Beach" in Cape Town, South Africa, and shares in an entity call "Mavior". Ms Dunne claimed those proceedings are unfair because they cover the same grounds as proceedings in the US. Mr Lehane argued the US trustee had offered to assist in ensuring there was no duplication of proceedings in both jurisdictions.